Norman Krischke states in his booklet, Corinth Baptist Cemetery, c1999: Information handed down by word of mouth relates that the Corinth Baptist Church building was erected near the East Navidad River on land owned by Ansberry Bass, later by Billie Bass. At that time the church was called "Brown's Chapel" inasmuch as there is reference to this church by that name. The formal name was: Navidad Corinthian Baptist Church as shown on a deed record. The original structure was moved about a half mile west to the present site so it would be near the center of the Black population in the area. 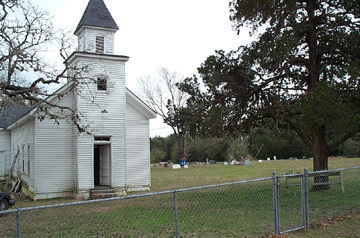 The church is now located on Vacek Loop or County Road 401. Corinth Baptist Cemetery dates back to 1893 according to tombstone inscriptions. Lucinda Rogers died April 10, 1893 and is the earliest marked grave. There are probably several graves without markers in the same area near this early grave. The area is directly behind or east of the church and it is said the area is full; there is no more space for graves. There are 9 known slaves buried here inasmuch as their date of birth predates the Emancipation Proclamation. There are six World War I veterans, and nine veterans of World War 2, Korea, & Vietnam. The cemetery is well kept and still in use today. Church services are held every second Sunday. The following survey was taken by Norman Krischke in 1999. In some instances, notes from Fayette or Colorado County Death Records is included. Lillie Mae Brightwell provided information from Tommy Taylor Funeral Home for burials since 1993. Additional unmarked burials have been found from death certificates. Most of this recent data is located at the bottom of Krischke's list of burials. 6 UNKNOWN No name or datas. Divining Rods show a female is buried here. 9 SALLIE ANDERSON 17 Jul 1895 22 Oct 1985 G Nee Fitzgerald. Daughter of Ed and Ellen (Jones) Fitzgerald. Died of heart failure. Fayette County Death Record (FCDR), Volume 15, page 725. 13 DOUGLAS E. DAVIS 30 Jul 1923 12 Jun 1981 BR MIL: US NAVY, WORLD WAR II. 16 MAGGIE W. DAVIS 7 Nov 1887 24 Jan 1983 CON Wife of Deacon S.L. Davis. 17 GARFIELD COFFEY 20 Jul 1881 01 Mar 1950 CON FCDR, 9/486: Son of George and Rosie (Jefferson) Coffey. Died of Cerebral hemorrhage. 18 MARY COFFEY 6 Oct 1884 10 Aug 1966 CON Wife of Garfield Coffey. 20 HENRY VISER 7 Sep 1892 17 May 1965 M MIL: TEXAS, CPL, CO. B, 135 LABOR BN, QMC, WORLD WAR I. 21 PRINCE WARREN CON No dates. 23 TENA DAVIS 27 Apr 1890 20 Jun 1953 CON FCDR, 10/228: Daughter of Luke Viser. Died of Appoplexy. 24 DOAK DAVIS 1 Mar 1888 12 May 1953 CON FCDR, 10/218: Son of John and Cora Davis. Died of heart failure. 25 UNKNOWN FHM No dates. DR: Male. 27 BEATRICE WOODS  28 Jan 1960 G "Daughter"
28 IDA M. DAVIS 4 Jul 1909 13 Mar 1950 G Wife of James E. Davis. FCDR, 9/497: Daughter of Alfred & Lucinda White. Died of influenza. 30 JIM DAVIS 1823 1 Feb 1920 G "Father". Aged 97 years. Former slave. 31 UNKNOWN FHM Stake of FHM only. 34 MALESSIS TOWNSEND 1880 1948 CON Wife of William Townsend. 36 PEARL SYDNEY 1 Feb 1899 26 Nov 1980 G Wife of Otto C. Sydney. 38 JOHNNIE LEON PERRY 19 Jul 1917 03 Jan 1999 NONE CCDR, 04-08-99: Nee Clark. 40 MARY WHITE 1 Feb 1915  G Wife of Victor White. 41 DELORIS WHITE 29 Nov 1927 13 Jan 1929 FL Daughter of Alfred and Olivia (Shepard) White. 43 AUGUST H. ADAMS 23 Aug 1918 15 Sep 1992 M MIL: PFC, US ARMY, WORLD WAR II. 44 LUCILLE ADAMS  1985 CON Ordinary picture glued to headstone; deteriorated. 46 LEROY ADAMS 25 Aug 1921 6 Aug 1965 M MIL: TEXAS, SSGT, CO. C, 514 QM REGT, WORLD WAR II. 48 MILLIGE ADAMS 13 Apr 1897 02 Apr 1984 M MIL: SP5, US ARMY, WORLD WAR II, KOREA. 49 DAVID ADAMS 16 Oct 1915 09 Jul 1972 M MIL: NEW JERSEY, SGT, WORLD WAR -I. 50 UNKNOWN FHM No name or dates. DR: Male. 52 UNKNOWN. FHM Funeral Home Marker reads: "Arthur Green". Apparently, when his government stone was erected over his grave at Site 58, his Funeral Home Marker was used to mark this grave. 53 UNKNOWN No name or dates. DR: Male. 54 JESSIE GREEN 04 Jun 1934 1942 FHM Age 8 years, 9 mos. 56 NATHAN GREEN 1896 1978 M MIL: PVT, US ARMY, WORLD WAR I. 57 UNKNOWN CON No name or dates. DR: Female. 59 UNKNOWN FHM No name or dates. DR: Male. 61 UNKNOWN FHM No name or dates. DR: Male. 62 UNKNOWN FHM No name or dates. DR: Male. 63 UNKNOWN FHM No name or dates. DR: Male. 64 IRA RICHARDSON 26 May 1891 21 Oct 1940 M MIL: TEXAS, PVT 1CL, 434 RES LABOR BN, WORLD WAR I. 65 ROBERT VISER, JR. 25 Apr 1942 20 Jan 1991 G "Buck"
66 MARTIN VISER 6 Jan 1897 11 Sep 1949 G FOUR INSCRIPTIONS ON SAME STONE; FCDR, 9/435: 19 Jan 1886 9 Jul 1949. Son of Luke Viser. Farmer. Died of Cerebral hemorrhage. 68 ROBERT JAMES VISER 9 Nov 1909 23 Mar 1968 G FOUR INSCRIPTIONS ON SAME STONE; FCDR, 13/157: Son of Martin & Fannie (Warren) Viser. Burned to death, house fire. 70 LUKE VISER 14 Feb 1845 21 May 1931 FHM FCDR, 5/197: Gives dates. Born a slave. 71 UNKNOWN FHM No name or dates. DR: Female. 72 LITTIE JONES 19 Sep 1894 10 Jun 1936 CON FCDR, 6/416: Daughter of Luke & Mollie (York) Viser. Died of a heart attack. 73 UNKNOWN FHM No name or dates. DR: Male. 74 UNKNOWN FHM No name or dates. DR: Male. 75 EDWARD WARREN 16 Mar 1891 01 Jul 1953 M MIL: TEXAS, PVT, CO. B, 509 SVC BN, ENGR CORPS, WORLD WAR I. 76 UNKNOWN CON No name or dates. DR: Male. Concrete grave frame. 77 DAVE POLK 13 Dec 1860 16 Feb 1927 CON Concrete grave frame. FCDR,13/605: Son of Fill and Marge (Davis) Polk. Aged 66 yrs, 2 mos, 3 days. Former slave. 78 GRACIE MAE GARRISON 20 Feb 1929 9 Dec 1995 G Nee Flowers, wife of Eddie Lee Garrison. 80 UNKNOWN BK No name or dates. Mound and brick. 81 LESTER GEORGE GARRISON 26 Jan 1886 1 Dec 1976 G DUAL STONE; "Loving Grandfather". 82 WILLIE D. GARRISON 27 Apr 1918 7 Nov 1969 G DUAL STONE; MIL: TEXAS, SGT, US ARMY, WORLD WAR II, KOREA, VIETNAM. 83 ALFREDO GARRISON FHM No dates. 84 CHARLIE G. GARRISON 26 Nov 1908 29 Nov 1974 BR MIL: SGT, US ARMY, WORLD WAR II. 86 UNKNOWN Female. FHM No name or dates. DR: Female. 88 FANNIE CUNNINGHAM 4 Jul 1983 23 Oct 1992 FHM Aged 9 years. 89 UNKNOWN FHM No name or dates. DR: Male. 90 UNKNOWN FHM No name or dates. DR: Male. 91 JOSEPH BROWN 28 Oct 1896 29 Oct 1951 M MIL: TEXAS, PVT, 19 REGT FARD, WORLD WAR I. 92 UNKNOWN FL No name or dates. Flowers only. DR: Female. 93 UNKNOWN FHM No name or dates. DR: Female. 94 UNKNOWN FHM No name or dates. DR: Female. 99 UNKNOWN FHM No name or dates. DR: Female. 101 UNKNOWN FHM No name or dates. DR: Male. 102 ROSA DENNIS FHM No dates. 103 BELLE FLEWELLYN 5 Feb 1872 26 Nov 1947 M FCRD, 9/194: Daughter of Dave & Alice (Lee} Dennis. Died of a heart attack. 105 DORIS MAE SULLIVAN   G Nee Adams, daughter of Louis & Myrtle Adams. Wife of Charles Lee Sullivan. 106 MYRTLE ADAMS 16 May 1900 30 Oct 1984 FHM Nee Wilkins, wife of Louis Adams. FCDR, 15/638: Daughter of Isom & Mary (Hamilton) Wilkins. Died of a tumor. 107 UNKNOWN FHM No name or dates. DR: Female. 109 UNKNOWN FHM No name or dates. DR: Male. 110 LEZZIE ADAMS 24 Nov 1864 24 Nov 1943 CON FCDR, 8/255: Born 21 Nov 1873, died 24 Nov 1943. Daughter of Dan & Francis Adams. Aged 70 yrs, 1 mo, 3 dys. Died of heart failure. 111 ROMANIA POLK 1897 1981 CON Nee Warren, wife of Willie Polk. 112 WILLIE POLK 1891 1979 M MIL: PVT, US ARMY, WORLD WAR I. 113 HORACE LEE POLK 27 Nov 1931 3 Apr 1949 CON FCDR, 9/402: Son of Willie & Romania (Warren) Polk. Cut with knife in Weimar Cafe. 114 UNKNOWN FHM No name or dates. 116 PHYLIS WHITE 29 Nov 1850 1 Dec 1929 CON FCDR, 5/57: Daughter of Alfred White. Died of cancer. 117 UNKNOWN FHM No name or dates. DR: Male. 118 UNKNOWN FHM No name or dates. DR: Male. 119 UNKNOWN FHM No name or dates. DR: Female. 120 UNKNOWN FHM No name or dates. DR: Rertiale. 121 UNKNOWN FHM No name or dates. DR: Male. Brick lined. 122 UNKNOWN FHM No name or dates. DR: Male. 123 UNKNOWN FHM No name or dates. DR: Male. 124 UNKNOWN FHM No name or dates. DR: Male. 125 UNKNOWN FHM No name or dates. DR: Female. 127 JENNIE ADAMS 14 May 1878 13 Aug 1968 G Wife of Jonah Adams. 132 LEOLA WARD 5 May 1896 24 Jul 1964 FHM FCDR, 12/353: Daughter of Jim & Ella David. Died of pneumonia, aged 68 yrs, 2 mos, 19 dys. 136 LUCINDA RODGERS  10 Apr 1893 G First grave according to tombstone inscriptions. 137 UNKNOWN FHM No name or dates. 138 ISABELLE LEE 5 Apr 1826 12 Nov 1922 M Probably wife of Elias Lee. Born a slave. 139 ELIAS LEE 8 Jan 1827 10 Jun 1897 G Born a slave. 141 ANDREW LEE 5 Apr 1853 23 Apr 1935 G FCDR, 6/233: Son of E. & Elizabeth Lee, Farmer. Born a slave. 142 LUCINDA LEE  1907 G Wife of Andrew Lee. Born a slave. 143 UNKNOWN BR No name or dates. Brick frame. 144 UNKNOWN FHM No name or dates. 145 UNKNOWN FHM No name or dates. 146 UNKNOWN FHM No name or dates. 147 UNKNOWN FHM No name or dates. Flowers on grave. 148 UNKNOWN FHM No name or dates. 149 UNKNOWN FHM No name or dates. 150 UNKNOWN FHM No name or dates. 151 UNKNOWN FHM No name or dates. 152 DAISEY JONES 1898 07 May 1961 FHM "Mrs." Aged 63 years. 153 T. ASHER  1955 FHM "Mrs."
154 HARRIETTE WILEOT R. HORTON 1829 7 Jul 1899 G Aged 70 years. Born a slave. Brick plot. 155 UNKNOWN FHM No name or dates. Brick frame. 156 UNKNOWN FHM No name or dates. 157 UNKNOWN FHM No name or dates. 158 UNKNOWN CON No name or dates. Thanks go to Debbie Hanson for helping prepare Mr. Krischke's cemetery survey for this site.